Learn the steps to improve your own health, then use it to help others. You'll see what I mean later in the article. It's easy to be confused about what to eat and what not to eat! Let's face it, eating healthy is big business. As we age we figure out that we only have one body, we're stuck with it, and if something goes wrong we have to deal with it. We begin to look for ways to preserve what we have. Doctors and scientists know that healthy eating is preventative medicine. They push out informative material in all kinds of ways. And when businesses see this information they want to develop a solution. So they make all kinds of products, some good, some not so good. Unless you know how nutrition effects you, by weight, body structure and current habits, you'll have a very difficult time knowing what is right for you and what is an outright marketing lie. Do You Want To Improve Your Own Health & Others? With the ever increasing trend of diet related diseases such as Obesity, Type 2 Diabetes, Cardiovascular disease and many more, the need to be educated in nutrition has never been so vital. Taking a local college accredited class for study or diploma could be your answer. If you like the idea of taking classes on a more convenient schedule or out of your own home, then an online course may be just the ticket. 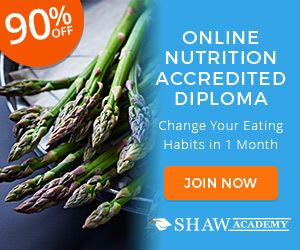 Taking an Online Course from Shaw Academy could be the right choice for you if your current job involves working with other people and your lack of nutritional knowledge is holding you back. This course will not only educate you on the most important aspects of nutrition but it will also equip you to put your knowledge into practice immediately! This Online Personal Nutrition Diploma offers you the opportunity to help yourself and others enjoy the best of health by gaining a comprehensive and practical understanding of the key principles of nutrition. This highly rewarding practical Diploma program is available to anyone wishing to learn more about nutrition, health and well-being from either a private or professional perspective. You should look into this course if you are looking to understand and adopt healthier choices for yourself, implement a new lifestyle balance for your whole family or embark on a new rewarding career in Nutrition. This course consists of 10 core topics, building up your nutritional knowledge step by step and with practical examples to allow you to seamlessly incorporate this knowledge into your current lifestyle. All lessons are presented online live, twice weekly, in a structured manner in order to allow you to learn efficiently. The live aspect of the Academy's delivery allows for interactive learning and the questions and answers session will deal effectively with all of your questions to ensure that you fully understand all of the information provided. Study when or where you please while also having full tutor support throughout your journey. Qualified tutors will support you during each step of your education. In addition to live presentation, all lessons can be accessed 24/7 post their release date so that you can truly learn at your own convenience. This means that even if you can’t attend a live session online, you can catch up on the lesson in your own time. Study when or where you please while also having full tutor support throughout your journey, making mastering and implementing this beneficial knowledge easier than ever. Should You Take a Nutrition Class? There are three reasons to take a nutritional class. The first is personal, for yourself or your loved ones. Secondly, if you are working in a health related business, taking a complete course and getting certified makes you a more valuable employee. And that is what you want to begin discussing reasons for a raise. Finally, if you are considering going into a health related business, be it yoga instructor, healthy living expert or diet consular, then taking one of these courses would be a necessary part of offering good and safe customer advise.